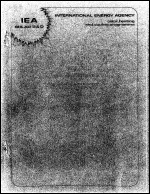 Editor: C.M. Lampert, Lawrence Berkeley Laboratory, U.S.A. This report summarizes five collaborative research projects on glazings. The projects include materials characterization, optical and thermal measurements, and durability testing of several types of new glazings. 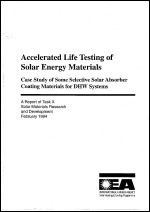 This report documents the results of a joint study aimed at establishing the use and limitations of accelerated life testing methods that are applicable to materials used in solar heating and cooling applications. 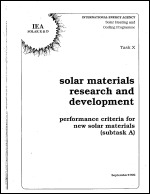 This report outlines the principal results of cooperative research on (1) a means of material selection for various solar applications and locations, and (2) a methodology to estimate the energy benefits resulting from such selections. The two primary materials groups investigated were spectral selective coatings on solar collector absorbers in solar hot water systems and transparent insulation materials. By: C. Lampert, Lawrence Berkeley Laboratory, U.S.A. It is widely know that most materials used in solar energy conversion and building energy control applications suffer from two major restrictions, the first being the cost-effectiveness of the martierial in a particular use and the second being durability. In the solar field, cost has been a very important factor and has srestricted development of more expensive but efficient materials. The issue of durable lifetime is coupled to the cost; since in many cases a more expensive material might have greater durability or operational lifetime. 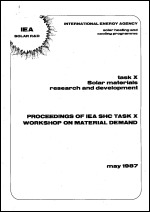 This investigation looks into selected soalr materials and how they degrade, fail or cease to function in their specific solar application, and explores methods by which certain materials can have their operational life extended. 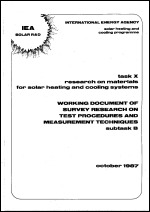 This report documents work conducted as part of Task 10: Solar Materials R&D of the IEA Solar Heating and Cooling Program. 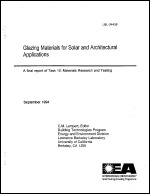 The test procedures and measurment techniquest for optical, thermal, mechanical, physical and chemical properties to evalusate material performance, material reliability and for material durability among the four designated solar materials categories such as window and collector glazing, collector absorber, heat transfer media with or without additives and heat storage material were surveyed. Evaluation and analysis of the state-of-the-art of materials testing and measurement methods were prepared on the basis of the compiled one hundred and thirty eight reports contributed by particants. Recommendations for interlaboratory testing, where required, to determine the durability of materials and to develop the data needed for the development of new and/or modified testing and measurement methods are emphasized. The background of the Workshop on Material Demand is the followings: Task X participants are always facing the difficultry to find out the comprehensive solutions restricted by the intra relationships among applciation fields, system consideration, component requirements and material itself for the development of cooperative research works even in the survey research.